New blogger, s and webmaster craze to get much traffic. Today I show you how to get much traffic without writing many posts. Because can get more than enough traffic by just writing 5 to 6 posts a month. Just write posts and updating the blog daily basis, will not help you much to get high traffic rate. 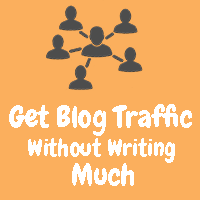 Below are the top (3) ways to get more traffic without posts daily bases or writing more article. Only share posts and subscribers are enough to get much you traffic. Because the secret of driving high traffic is sharing things time and time or again and again to everyone. So spend double the time in post promotions too. There are tons of social media sites, like a Facebook is no, 1 for to get high traffic rates, and bookmarking sites, forums and you also check below link to. After all, there is no point writing anything which will never be read. To make sure your content reaches a wider audience, share or publish your posts to everywhere in internet market. Do not spend time guest posting on scummy blogs, always work on establishing relationships with fellow bloggers in your own niche or the niche which is related to yours. If you are a website or graphic designers who own a community or blog and ask them to share your posts, this method provides you real and targeted traffic to your blog. Using this strategy you are trying to reach people who you would have never got to reach otherwise. Another way to drive others audience at your blog is by guest posting on popular blogs and websites. Get a few quality backlinks, popularity or authority bloggers linking to you can get you handsome amount traffic. Always know you one single (Quality Backlink) is better than the 100, of spammy backlinks. So only getting quality backlinks also helps to get good rank in (Search Engine Optimization). Much backlinks to your blog means more traffic for your blog. And (Quality Backlinks) helps you to better the search engine rankings. Some blogs even link back to their guest blogger’s blog. So, guest blogging too is a good way to earn quality backlinks. But submit your posts Social Media 1st. Now start ! Turning them into action because these are the most unused strategies. If you have some other tips or strategies that you use to get more traffic to your blog, leave a comment below in the comments area.